We specialized in delivering terrific sound systems for movies, music, and sports utilizing the state-of-the-art surround system electronics. At every price point, we can design, sell, and install an appropriate audio system to support your video system. Even when minimum visual impact is a priority, we can insure you will hear the outstanding sound that accompanies HD programs. We feature Electronics and Speakers designed and built in the US, UK, Canada, and Japan. From a simple soundbar for your bedroom TV, to a full 7.1 surround theater, call today to discuss your options. 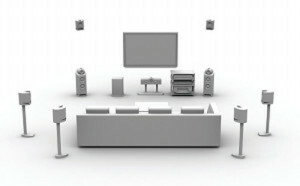 A surround system doesn’t have to look like this, let us show you what fits for your home. See some of the systems in our photo gallery.